"Smooth" was the word of choice among TV critics trying to characterize the debut performance of George Stephanopoulos as co-host of Good Morning America. "George Stephanopoulos slid over into Diane Sawyer's co-host seat . . . so smoothly Monday that the most noticeable changes were the hair, jacket and jewelry," wrote David Hinckley in the New York Daily News. "Stephanopoulos seemed pretty smooth and comfortable in his own right for his first day," agreed The Baltimore Sun's David Zurawik. "Stephanopoulos moved smoothly if not memorably into the anchor chair," opined Tom Shales in The Washington Post. So we're agreed, then. It was smooth -- but not as smooth as it would be if Stephanopoulos weren't such a wee fellow. Both Shales and The New York Times's Alessandra Stanley pointed out the glaring height differential between Stephanopoulos and his new co-host, Robin Roberts. Stanley said the disparity impeded the duo's "natural chemistry;" Shales said it made for "awkward moments" whenever Stephanopoulos had to line up with the "statuesque" Roberts and their other teammates. Here's a sampling of what these and other critics had to say about Stephanopoulos's maiden voyage. You may have objections to his style or his political background, but I think it's pretty much a given that he has the skill set to manage the news interviews that (usually) dominate the opening hour of the show. Stephanopoulos will need to master some sort of regular-folks connection to his viewers -- not necessarily pretending he's one of them, which he's not and shouldn't have to be, but maybe at least loosening up and having fun with his fish-out-of-water situation. Mr. Stephanopoulos didn't adjust to the tabloid tone of morning news so much as bring his sober Washington talk show with him to the ABC studio in Times Square. . . . Mr. Stephanopoulos will almost certainly have more silly features in his future, but it looks as if he won't entirely shun his political past. On a network morning show, that's a refreshing change. Stephanopoulos himself has clearly studied and learned the TV game well. 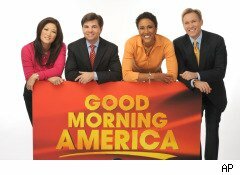 With his boyish smile and pleasant demeanor, he could have been ordered right off the TV-host assembly line –- which is not to suggest that filling a slot like "GMA" co-host is anywhere near as easy as it looks. He has a guy-next-door voice, not a classic "voice of God" TV news voice, and that serves him well on "GMA," where the goal is to make viewers feel as comfortable as David Axelrod. He also has an endearingly self-deprecating streak.